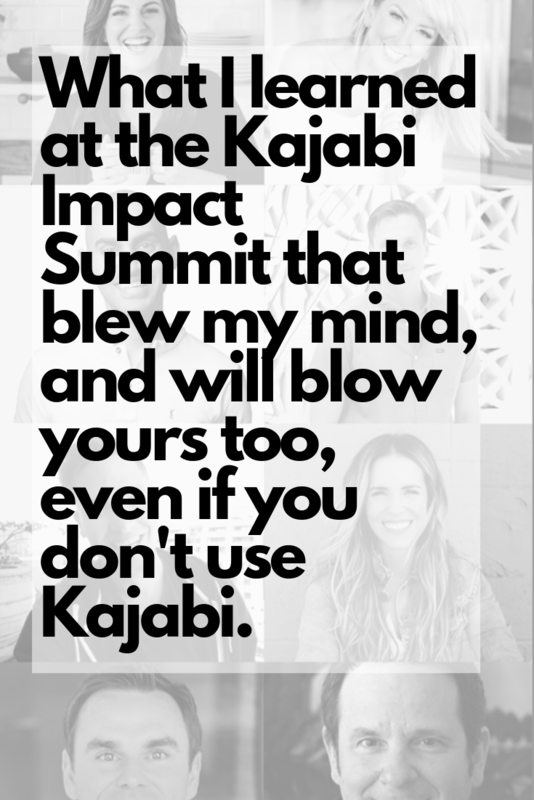 What I learned at the Kajabi Impact Summit that blew my mind, and will blow yours too, even if you don't use Kajabi. A new family of templates called “Encore”, which will be a successor of Premier. Sales tax: collection and reporting right inside the platform. Hero University will be more integrated into our experience and will offer many more free courses. There is a new app for Hero University available for iOs and Android and it’s available now. 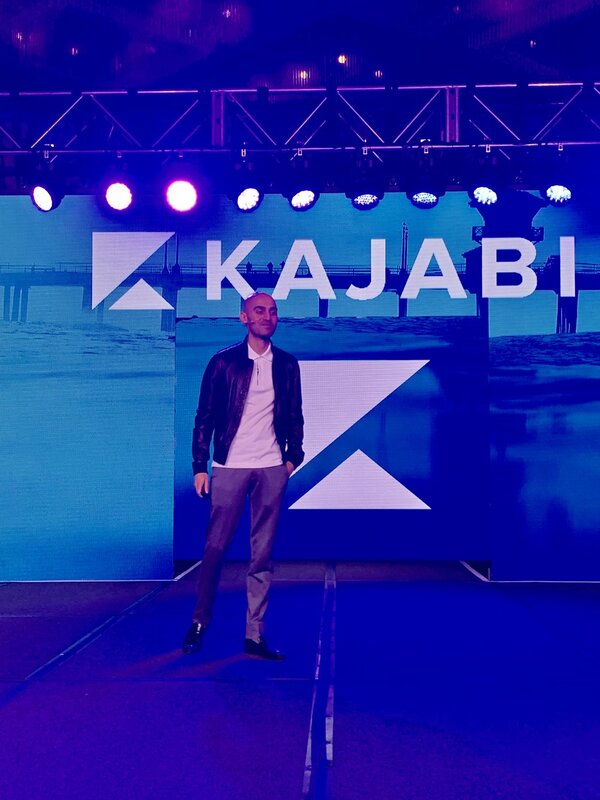 By the fall of 2019, Kajabians will also be able to create apps for their products/sites. Once someone earns $37K, they will likely earn 100K. When we do our research for our copy, look for “should I” searches such as “Should I vaccinate my dog before or after house training?” .Obviously, you will tailor this to your niche. Also, look for “ideas” searches, such as “ideas for green smoothies”. 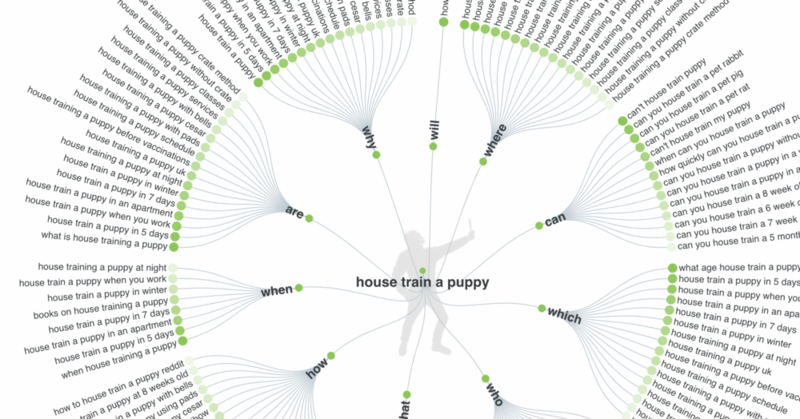 Frasier recommended using Headline Analyzer to test you headline and Think With Google and Answer The Public to get ideas. Frasier recommended using this Customer Avatar Worksheet by Digital Marketer to get a better grasp on who our audience is. What I Wish I Knew Before Launching My First Digital Course. Give yourself the space to create. Minimum of five hours per week. Block it in your calendar. Stay horizontal as long as possilble. So many of entrepreneurs rush out to create more products after the launch, but she shared how the real way to grow is to launch it, then continue to perfect it and launch again and again. She gave the example of her first launch of Profit Lab…first launch, 30K, second launch 200K, and then 950K. Your launch success is determined by your non-launch efforts. That mean, create consistent content year round, and deliver value. Not just when you launch. 99% of your launch decisions should be made before your launch begins. In other words, have a plan, Stan. Your offer can make or break your launch. One bonus AP has had success with recently is a full analyses of her launch results. Will you offer support? How? One webinar is never enough. Do at least 4 for a 10-14 day launch. Send more emails! 3 emails should go out on cart close day. Tell More Stories. Bring the human touch to the launch. Throughout the launch, after cart open, when people sign up message them or email them and ask them to record a video about why they joined and post it in the Facebook group. There is power in simplicity. AP only launches with webinars and emails. (and Kajabi). Jasmine Star delivered a fun, high-energy and inspiring presentation all about Instagram. Big takeaway here is to have a plan. Week 1: Warm up by positioning your business in a favorable light. Remind them with specificity what you do. Non promotional . No mention of product. Week 3: Promotion Sequence: Position your business as the solution to what they’ve been stuggling with. Regarding hashtags, Jasmine’s practice is to leave one in the caption to drive traffic, and 29 more in the comments to be part of conversations happening around those hashtags. I didn’t expect to like the next speaker, Casey Graham, who is the founder of a company called Gravy, because he was an event sponsor. But he actually ended up being one of my favorite speakers. I particularly loved his quote “never despise a small beginning. That’s where you build the habits for when you are big”. And also “pay attention to paying people”. That really was the focus of his talk: treat your clients and customers like gold, because they are gold. He said “the forgotten funnel are your paying clients”. Pay attention to paying people. Another key take away was to make every interaction incredibly easy for your client. Make sure to break down steps: “do this first”, “do this next”. He told us about the Full Story app that will allow you to watch a new user, in real time, navigate your site, product. Casey also said “do for one what you would do for everyone”. He gave everyone a stamped envelope and blank notecard and we all wrote one customer an email telling them how much we appreciate them as an example of what this principle looks like in action. Rachel Hollis is not someone who I was familiar with before this conference. Obviously I know who she is, because you can’t pass an airport bookstore or grocery store magazine stand without seeing her face. But I was unfamiliar with her work. Rachel’s talk was very motivational. I loved one interaction she has with a girl in the crowd who raised her hand to express that she wanted to do what Rachel does…speak from the stage, impact women around the world, etc. but that she felt like there wasn’t any point, since Rachel was already doing. Rachel responded by saying “don’t compare my middle with your beginning”. Imagine you have 6 soccer balls and you are allowed a total of 6 kicks. If you take turns kicking each ball one time how far will you get versus kicking one ball, six times? It was also very interesting to learn that she sells her incredibly successful journal from her Kajabi site, as Shopify integrates beautifully with the platform. She recommended the book “The Road Less Stupid”. While it seems that Rachel Hollis sprung up out of nowhere, she’s been working hard at her blog for 15 years and she published 5 books prior to “Girl, Wash your Face” that she said no one read. Roger Love, the world’s most famous vocal coach gave such a fascinating presentation about how important it is that we use our voice (our actual voice) deliberately. He called up volunteer from the audience who had a nasal-y voice and before our eyes completely transformed the way she sounded. There were these great interludes in between sessions when JCron or Kenny of Kajabi would facilitate different discussions, and one of my favorite sessions was about the state of the knowledge commerce industry. The big takeaway here is that there is a shift from just information products to transformation products. How quickly and easily can you get someone from a current state to a desired state? Our courses must be combined with coaching and connection and community. What was most impactful for you? What was most confusing to you? Was anything frustrating or overwhelming ot the point of wanting ot stop? Anything else I should know to help improve this experience? 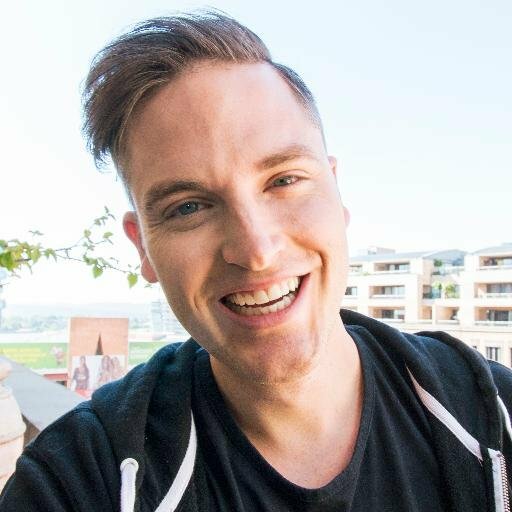 How in the World Are Influencers Making $10M a Year? You are responsible for this dream sewn in your heart. Step into the truth that you can lead. You are in charge of your business. If you don’t take full ownership of your dream, you will never scale. You have a lion in your heart. Stop living like a mouse. Don’t create niche products. Market to niches. For example, Apple has six products. They didn’t create an iMac for chiropractors and one for lawyers. You can market the same product and shape your marketing for those niches. Discover your audience’s problems AND ambitions. Sell a higher aspiration…lead with aspiration. Define your story..the one that’s relevant to the struggles and aspirations of yoru people. Let your message be meaningful…a message you are supposed to share. Excellence only takes two weeks longer. Perfectionism: by very definition of the word perfect…you can’t perfect something unless you release it! Post a weekly blog or vlog. Post 4 pieces of content every day on social media. Every Friday look at which posts did well and then boost the winners. Save the winners in a folder on the cloud and re-use them in future weeks/months. Create evergreen campaigns for your products. Run ads all the time. All that adds up to $1, 117, 200 per year. The story that illustrates the solution and that elicits emotion. Rejection/risk (if you don’t take action, you can stay stuck, throwing spaghetti at the wall and doing it the hard way. And things will stay just the way they are now. Research before you record: go to YouTube search. As you type in your topic, pay attention to the autocomplete because it will populate with suggestions of things people are actually searching for. I particularly like a Pipeline that he set up in Kajabi that takes YouTube viewers of his videos to a webinar. This is a prerecorded webinar that then takes them to a sales page for his course. What I liked about this Pipeline is that it is very simple..I’m not sure they even opt-in. I think they watch the YouTube video, then he says “If you’d like more information about this, click here for my webinar”. Next they go right to the webinar which is very obviously a recording…he leaves scrubber bar on there allowing viewers to fast forward and rewind, etc. Our last day kicked off with another QA session. One woman stood up and said that she was confused about whether or not she should launch a big (expensive) course or a small (less expensive) course. JCron said “Ikea is a on the list of the top 500 companies in the world and so is Louis Vuitton”. Blog at least once a week. It’s all about the headline. Use sub-headings and keep paragraphs short. Spend 80% of your time promoting. Biggest takeaway from this session for me is that after we upload video to YouTube, we should email our subscribers about it immediately because YouTube ranks based on the first 24 hours of activity. He recommended that if you are trying to build a personal brand, that it’s a good idea to speak at 4 conferences a year, and to go live 3 times a week. Tragically, I had to leave before James Wedmore’s presentation. 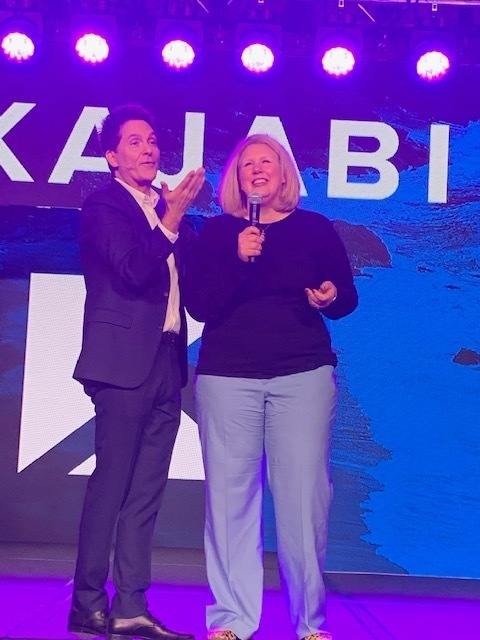 This was an outstanding conference and I can’t wait for Kajabi Summit 2020. Did you attend the conference? What were some of your biggest takeaways? Today Jen is talking to Teresa Heath Waring, a friend she met sitting in the front row at Social Media Marketing World a couple of years ago. As a fellow front-rower and marketing expert, she and Jen talk all things email marketing. 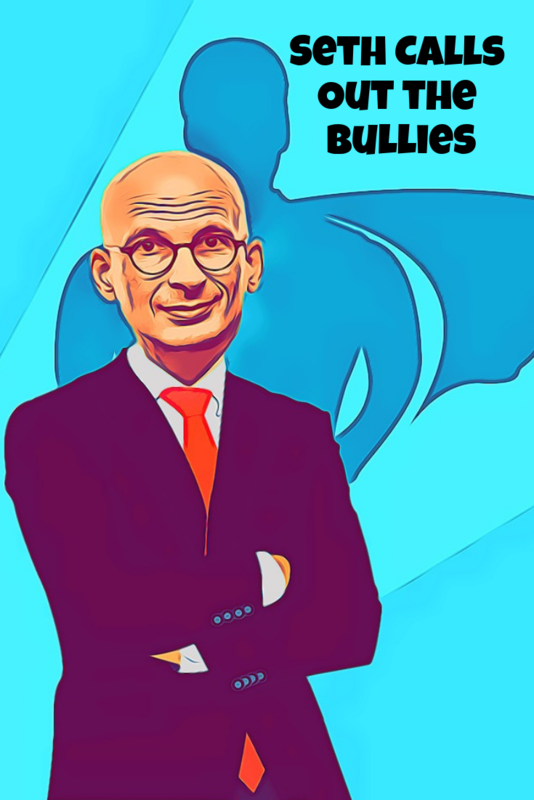 Seth Godin wrote a blog post today about the way EMI, Inc., has bullied me, and other entrepreneurs. You see, somehow, Entrepreneur Inc. got the trademark for the word "entrepreneur" years ago and since then, they've been going after little guys, like me, and threatening to "take action". My podcast, "The Front Row Entrepreneur", it seems, was infringing on their trademark. You know, much like how a speck of dust infringes on a mountain. This has actually been going on for quite some time, but I haven't talked about it because...lawyers. And also, it's just been exhausting, demoralizing, and oh so frustrating. And then, yesterday, I got an email from their lawyers telling me they found a few more things on my website that still had "entrepreneur". One of the things was literally a blog post "What is a Front Row Entrepreneur?". 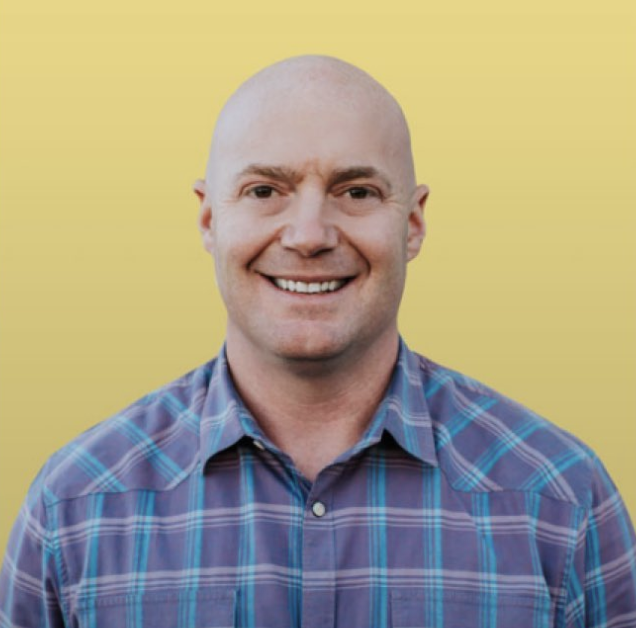 Since Seth Godin was on my podcast recently, and he knew about this situation, I forwarded him the email and said "I just wanted you to see how far they go." He asked if he could write about it. Who better to call them out than the godfather of marketing and entrepreneurship himself? OH YEAH! YOU GO, SETH! Not even an hour later, he had finished his article and now you can read it here. I would really love it if you would share the article far and wide. I'm done being scared. Because it really is time for this bully of a company to stop what it's doing to the hardworking entrepreneurs of the world who they claim to support. If you tweet it, be sure to tag @Entrepreneur and also @ThisIsSethsblog and ofcourse me, @jenrgy. In support of my friend @jenrgy I am going to change my Twitter name to include the word Entrepreneur. Sue me @entrepreneur, I stand up to your bullying. Thanks to @ThisIsSethsBlog for spreading the word on their tactic to harass good people. @Entrepreneur is sending the dogs out for the use of the word “Entrepreneur!” You’re suppose to be helping entrepreneurs not hindering! My friend Jen @jenrgy had a fabulous program with her Front Row Entrepreneur, has to change everything because of the word Entrepreneur! Wait a minute... They are threatening action unless you stop using the (super common) word #entrepreneur??? That is REDICULOUS!! 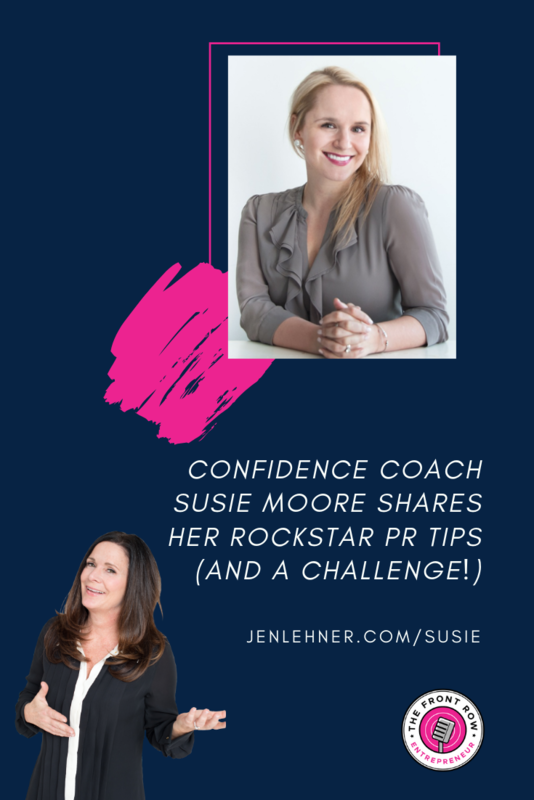 Susie Moore is a New York based confidence coach and author. She’s been featured everywhere (really) and figured out how to get all that media attention without a degree or a PR machine behind her. She teaches others how to pitch and “guest post” at outlets that will get you noticed! Let me know your takeaways, after you listen! Do you still agree with this? More than ever! The chances that individuals have to speak up and be heard have never been bigger. Your book made marketers feel good. That our work really matters. Does marketing really matter? The work of marketing? Is it something that can leave a legacy? Every single person who has done work that mattered has been a marketer. Seth explains why this is true today and gives great historical references that will surprise you. Marketing is about sharing good ideas that matter, and ideas that will change how we look and think about the world. If our work is going to matter, it’s up to us to use the tools to uplift or tear down or we can use them to connect or to separate. It’s up to us to use the tools in a way that you are proud of. Yes, it matters. You talk about the smallest viable audience. It was good to read that I don’t have to have an email list of 100K. Can you talk about that? The idea of mass works when you can get it at a discount. That’s not possible anymore. And people don’t want average products anymore. The path instead is to ask what is the smallest group I can live with that has a unique connected set of values, desires, dreams and fears? How do I delight that group? How do we deliver “above average?” How do we bring out our actual magic? What I can point out is the effort you need to bring out your actual magic is worth the journey. What we know is that with awareness and persistence you can develop skill and if you aim that skill in a specific direction you can become a “meaningful specific” instead of a “wandering generality.” h/t Zig Ziglar. x way to get above average results is to be obsessively focused on a small group of people who want to hear from you. You also talk about the magic of good enough. Can you talk about that? Certain things have to be significantly beyond good enough. That’s what makes them remarkable. Everything else just has to be good enough. Hear the breakdown and insights that help you determine when each is required. What is it that you want to own? What is it that you want to do? Everything else can be good enough. I love what you say about authenticity. Some buzz words have been used so much that they have lost their impact. Authenticity feels like that to me. Authenticity is a distraction. If we are hiring a professional to help us, like an attorney, we are not seeking to know about that person’s life. We want them to make a promise and keep it. That’s what we buy. Seth shares some tough love advice about taking a stand. Why consistent wins over authentic. You have said that culture beats strategy so much that culture is strategy. Can you clarify that? Strategy is supposed to be like playing chess. I love strategy. But what’s really going to determine how everyone acts everyday is going to be the culture. Seth shares the Starbucks example and why the message was meant to impact the culture. The culture becomes the strategy because that’s what the company stands for. The conversation about pricing was a big relief. Can you talk about that? Price is a story. It is not based on what something costs. You are paying because the price is supposed to help you understand what the thing is supposed to be. Many people wrestle with pricing because they don’t believe they are worth it. It’s not up to you to decide, it’s up to the customer to decide. There are lots of customers that would prefer the responsibility and status that comes with paying more than to be the person who buys the cheapest thing. Charge what you need to charge to do work you are proud of. That will find you the customers who are ready to pay that. No one will pay it because you deserve it or because you are working hard. They are going to pay it because it makes them feel they did something smart. We can also relate this to the freelancer/entrepreneur who could commit to having clients invest at a higher level. If you don’t believe that what you are offering is worth it, please stop offering it! Let’s start there. If we think our service is worth $100 but we are charging $50 then it’s a gift. We’ve talked about entrepreneurs and freelancers. I want you to clarify the difference for us. Also, I often hear people who feel like they have a real business. There is a difference between entrepreneurs and freelancers. Entrepreneurs build something bigger than they are. They are building an organization that one day they can sell. Freelancers get paid when they work. They do the work with their own two hands. If you are an entrepreneur, don’t do the work! Your job is to hire people to do the work. Your job is to build systems and processes so that you make money when you sleep. It’s so you can make an impact on a bigger scale. The people who don’t feel like they have a business are freelancers. And that’s okay. Find clients who will pay you appropriately or spend time getting better at what you do. Why is asking “how do I get the word out” the wrong question? Because it’s selfish! It’s like saying if everyone knew what I did, then I’d have lots of business. You already have a small group of clients that you are serving. Why aren’t they telling others? Solve that problem. If your customers are telling others, then you don’t have a getting the word out problem. If that’s not happening then the work is inherently private (so people don’t talk about it) or it’s not remarkable enough for people to share it. Solve that. These questions are about a variety of things that I wanted to ask. Some are personal, some are about Seth’s methods and I ask about some of his favorite things. His answers are amusing, and truthful and they’ll make you think. Seth’s heroes. An impressive list of people who understand how to navigate how ideas spread. People who show up because they choose to not because it’s easy. The best advice Seth ever received! Are you addicted to your phone like the rest of us? How do you write the blog posts? Do you batch them? How have you maintained the consistency? What career would you be doing if you hadn’t chosen marketing? Do you have morning routines? Good advice here – and not what you’d expect! How do you come up with such good metaphors? What’s your favorite book? He made a recommendation for our listeners. What’s the first things you’d do if you were starting a business today? This answer is incredible. What’s your favorite thing? 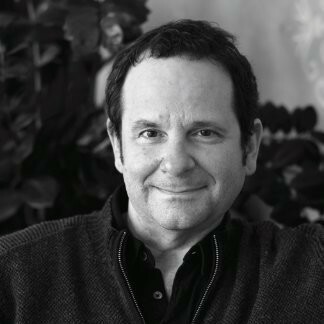 He shares a real insight about why he does the work and why it’s so meaningful to him. Final words: Keep Making a Ruckus! This is an incredible new app that would be useful for any website, but I think is particularly phenomenal for membership sites. That’s because it allows you to share announcements with your members in a few very slick ways. This is what Beamer looks like on the sales page for my membership site. This is what Beamer looks like INSIDE the membership site. The biggest challenge with membership sites is that members start off with good intentions but they never get to the majority of your content. After a few months of getting billed by you, but having not consumed any of your content, they cancel. With Beamer, each time a member comes to the membership site, they will see exciting announcements. You can bring their attention to something new you’ve got going on or maybe feature content that’s been in the membership site for a while that they may have missed. If your member allows notifications, then each time you publish something new to your Beamers, they will receive a notification! Are you using Beamer? Put a link to your site in the comments below…I’d love to see how you are using it! If you aren’t using Beamer yet, they have a 14 day free trial here. Got a podcast or Alexa flash briefing skill? Wonder how to repurpose your audio content for people who don’t have an Echo device or don’t listen to podcasts? 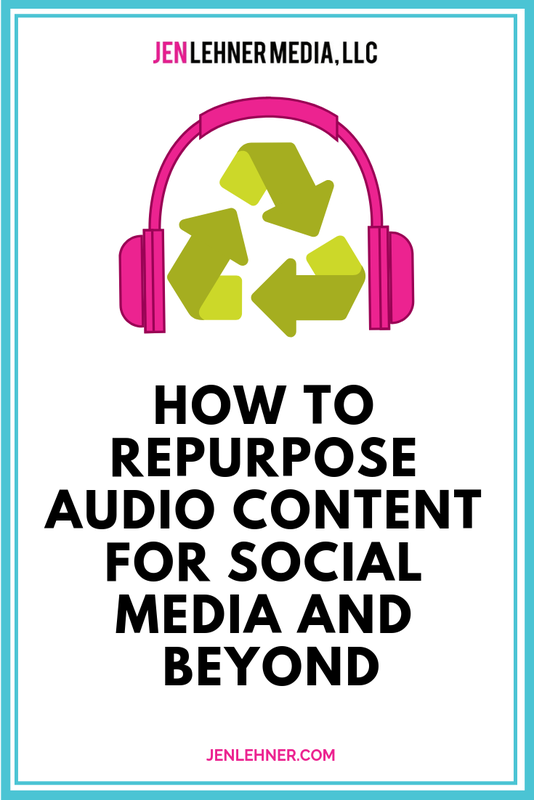 In this article, you’ll discover how to repurpose your audio content to reach a wider audience. Sharing and repurposing your Alexa flash briefings and podcasts across other channels are wonderful ways to reach people who might not yet even be aware of your broadcasts. One way to do this is to upload the audio to Headliner. Among other things, this free web-based app allows you to upload audio to create audiograms. Audiograms are technically videos, but they present like a graphic with an animated audio wave as an overlay. The app will even transcribe the audio into text and overlay it on the graphic as well. To create an audiogram, go to Headliner and start a new project. For this example, select Audiogram Wizard to create a video from a flash briefing. If you want to make a video from a podcast episode that’s longer than 10 minutes, select Full Episode instead. On the next page, click Choose File and navigate to your flash briefing file, or drag and drop your audio. Once the audio is successfully uploaded, click Next. On the next page, you have the option to edit the start and end of your clip. When you’re done, click Next. Now choose an aspect ratio and then click Next. Square is best for Facebook, Twitter, and Instagram. The next step is to select your wave type, wave position, and wave color. Then click Add Background Image and navigate to your image file. When you’re finished, click Create Project. After your audio is imported into Headliner, make sure the audio transcription is switched on for captions. When you’re done editing the transcription, click Export. In the Export pop-up window, type in your email address so you’ll receive an email when the video is done. Because flash briefings are short (10 minutes or less), these exports usually only take 2-3 minutes. With podcast audio, the process will take a little longer. 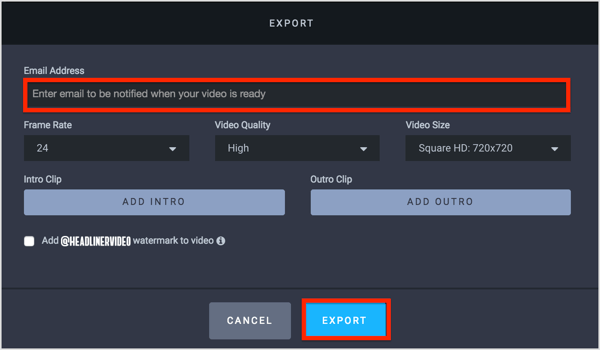 After you click Export, you’ll see a message that your video is being generated. When it’s finished, you’ll see a download link in a pop-up at the top right of the page. When you click the link to download your video, you’ll see options to download the file as an MP4 (video file) and get a link to share the audiogram. Now you have a piece of content that you can share across multiple platforms. One way to share your audiogram is to send it out via a Messenger bot like ManyChat. ManyChat is a visual bot builder for Facebook Messenger with broadcasts, analytics, scheduled posting, and many other features. To deliver your bot to subscribers, you’ll first need to set up a growth tool. 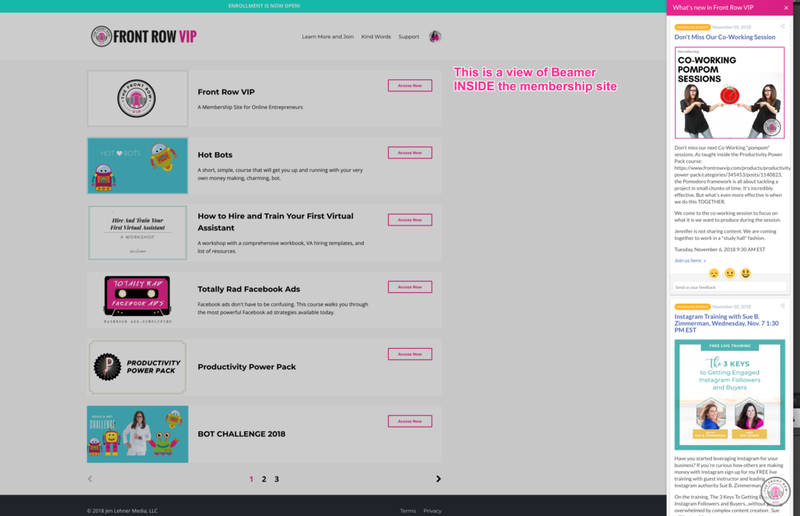 Inside the Growth Tools area, you can customize a number of different overlays, widgets, and pop-ups to encourage people to engage with you via Messenger and join your subscriber list. Select Growth Tools on the left and then click the + New Growth Tool button in the top right. You now see a list of widget types and growth tools. Select the Messenger Ref URL growth tool. This tool will give you a link you can place anywhere (social media, email, printed on a business card, etc.) and it takes users directly into Facebook Messenger. Name this widget so you can easily identify it and then click Edit. 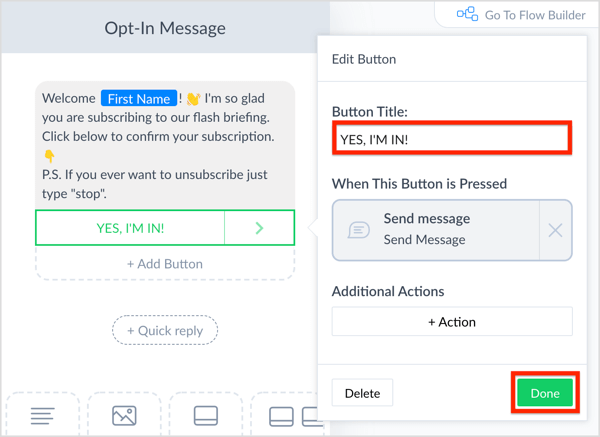 On the next page, name your opt-in message and click Edit Flow. Now compose your message. When you’re finished, click + Add Button. Type in a name for the button and click Done. Next, click Go To Flow Builder in the top-right corner. This opens ManyChat’s visual editor, which is a bit like a mind map. Click the option button next to your call-to-action button and then click Send Message. Now compose your message. 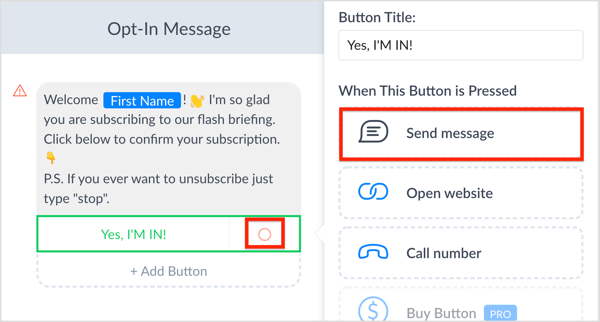 You can personalize your message by clicking the curly brackets icon and adding emojis. When you’re finished, open the Broadcasting tab on the left side of the page. This tab is where you can deliver broadcast messages to your Messenger bot subscribers. In many ways, it’s similar to sending a broadcast email from your email service provider. Click + New Broadcast in the upper-right corner of the page. Now compose your message and add your buttons. For this example, you’re sharing the audiogram for your Alexa flash briefing, so add buttons for Listen Now, Listen on Alexa, and Leave Review. For the Listen Now button, add the link to the video you created with the Headliner app. This link will take users directly to the audiogram you created for your briefing. For the Listen on Alexa button, add a link to your skill in the Alexa Skills store so people can subscribe to your flash briefing there. Finally, for the Leave Review button, include the link that will take people to the review page on Amazon.com. The more reviews you have for your flash briefing skill, the more visible your skill will be in the Alexa Skills store, and the higher your skill will rise in search overall. After you set this up once, it’s easy to duplicate the broadcast each day, switching out only the link to your audiogram and any relevant text in your message. Upload it as a video natively to LinkedIn and Facebook. Use it as your creative in a Facebook ad. Upload it to YouTube (since technically it’s a video). If your audiogram is a minute or less, upload it to Instagram. You can upload your flash briefing or podcast audio to Temi and get inexpensive transcripts to convert it into blog posts. Embed links to these posts on a show notes page that’s designated specifically for your flash briefing or podcast. Not only is this a wonderful way to drive traffic back to your website, but also your content is no longer ephemeral. All past episodes can live here in a library. It will give your listeners a place to ask questions, give feedback, and explore any resources you’ve mentioned in an episode. As the adoption of Echo devices and Alexa flash briefings grows, so too will your Alexa audience. You want to make it easy for people who become aware of your briefings via the tactics above to find and subscribe directly to your briefing when they own a device. These tips will help. Alexa flash briefing skills are searchable in the Amazon store and the Alexa Skills store. To get found by listeners, it’s imperative to pay attention to keywords. You’re allowed 30 keywords and it’s recommended that you use all 30. This will require some testing, so you’ll likely want to rotate your keywords monthly. If you’re unsure what your keywords are, you can use Google Keyword Planner as an approximation for what people are searching for on Amazon. You can also search for the top skills in your niche, and use the titles of those skills in your keywords. The most important factor in having a successful flash briefing skill is consistency. While this is true for everything in marketing, it’s particularly true for flash briefings. Because it appears that most people are listening to this short content (10 minutes or less) daily, your briefing becomes part of their daily routine. If you only upload once a week, or even less frequently, your listeners will hear the same audio each time they tune in, or they’ll get an error message and then stop listening. This doesn’t mean that you have to actually record each day. You can batch record and upload for scheduling. Add the briefing to your Alexa Echo or your Alexa Dot ("Alexa, add The Front Row Entrepreneur Flash Briefing" http://bit.ly/FrontRowFlash). What do you think? Do you have an effective way to promote or repurpose your flash briefing skill that isn’t listed here? Tell us about it in the comments below.